Northern Ireland’s — and perhaps the world’s — sole Steve McQueen-themed hotel was opened by the Beannchor Group (which also owns Belfast’s opulent Merchant Hotel) in October 2016 with 43 rooms. Last October it opened a rooftop garden terrace and bar, and in December 2017 added 31 additional rooms. Named for the late star’s car-chasing 1968 detective thriller of that title, the hotel calls itself no-frills, but the design is fun and stylish. Visitors liked the theme so much that soon after its opening, two older women tried to swipe a six-foot canvas of McQueen smoking a cigarette behind aviator shades. The near-heist generated publicity for the new hotel as the Not-So-Great Escape, but the desk clerks who checked me in swore it had been a true crime, not a stunt. As Belfast has settled into two decades of post-conflict peace, the Cathedral Quarter where the Bullitt is situated has emerged as one of the city’s most vibrant neighborhoods, with restaurants, hotels, shops, and edgy street art. 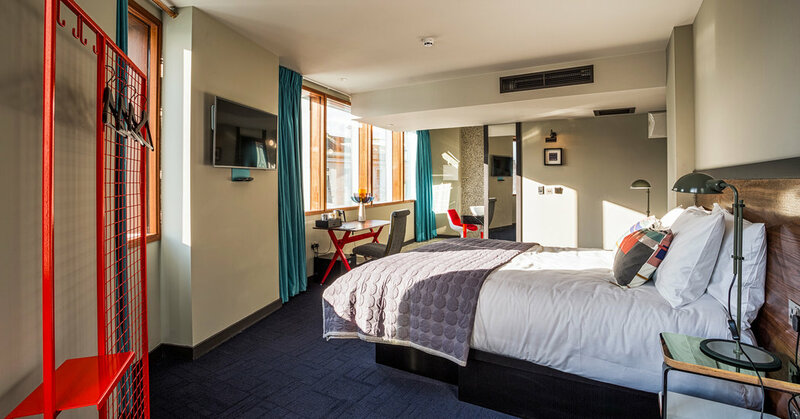 The hotel is also a doable stroll from the riverfront and blockbuster Titanic Museum, as well as some of Belfast’s most character-saturated pubs. Bullitt rooms are named in three sizes: “Dinky,” Comfy” and “Roomy.” Slate-gray paint and a full-wall mural of “Bullitt” stars Steve McQueen and Jacqueline Bisset dominated our mid-sized and indeed comfortable room. Playful touches include the warning “Faceplant!” printed on the double-paned windows (which didn’t keep the childhood friend with me from bonking her head trying to see the space-themed “Intrepid Traveler” art installation outside). Replacing a closet was a bright red wire rack with a few hooks and hangers, along with a simple luggage rack, desk, TV and a tiny metal shelf for the remote. No iron was provided, but a basic model was delivered within two minutes of asking. White square tile on the walls and gray square tile on the floor, the bathroom was all business. Toiletries bcreated for the hotel were provided in a tart Irish nettle scent. An oversize rainfall showerhead was mounted high; and while the water temperature could have gone hotter, the warming towel rack was nice on a cool Belfast day. The Bullitt offers a calendar that includes events like knitting classes, literary readings and running-club jaunts. When we walked into the attractive courtyard, an artist’s lecture was happening as part of the Belfast Photo Festival. There was no in-room minibar, but supplies for hot beverages were fairly well-stocked: Dragonfly teas, Lyons instant coffee, fair-trade hot cocoa and mugs with “Hello Brewtiful” on the bottom, plus fresh milk in the tiny fridge. Basic black loaner umbrellas proved handy for Northern Ireland’s ever-threatening rain. The hotel has two happening lobby bars, one for coffee and the other for cocktails, along with a separate ski-themed bar, Baltic, that was closed during our visit, and the rooftop bar called Babel. Its restaurant, Taylor & Clay, serves meat-and-potatoes fare like a Wagyu sirloin that arrived tougher than expected; the side of creamy root veggies and peas, which subbed for fries, swiped the show. Breakfast is served at Taylor & Clay and the hotel also plays up its free Grub to Go bags, which include fruit, yogurt and granola. Preferring a hot meal, I called room service, which arrived 18 minutes later. My server said delivery was “definitely not” often ordered, and since the sourdough toast and poached eggs (about $3 each) cost less than the delivery charge (around $9), I could appreciate why. The Bullitt has a good time with its king-of-’60s-cool muse, and as Belfast re-emerges, guests who want fun with no frills are set up to play, too. January 17, 2019 Comments Off on Why are the Chinese buying fewer cars?